Inverse photoemision can be considered the "time reversal" of the photoemission process . An electron can be absorbed by the material into an unoccupied state above the Fermi level, in doing so it will emit a photon. The principle of inverse photoemission is this photon can be detected and therefore information about unoccupied states in the material can be obtained. This is complimentary to photoemission where information about occupied states below the Fermi level is obtained. Figure 1 is a diagram showing the inverse photoemission process. Experimentally IPES is different to PES as you need to detect photons, rather that electrons, and resolve there energy, this is a difficult task as they cannot be manipulated with electric or magnetic fields as is the case for electrons. It is possible to do this in two ways: Use a detector limited to a fixed photon energy range referred to as a Bremsstrahlung isochromat (BIS) and then scan the electron beam energy to investigate the region of interest , or use a grating type spectrometer to record a spectrum of the energies. The first method is more commonly used as it cross section for the inverse photoemission process is very small, this leads to a weak signal if this signal is the dispersed in energy no signal will be recorded, the disadvantage to this approach is the poor energy resolution. Because both energy and reduced momentum are conserved during the process it is possible, by resolving the incident electron momentum to map the unoccupied states dispersion in a analogous way to ARPES. This is know as k-resolved Inverse Photoemission Spectroscopy (KRIPES). An example of a possible BIS is shown in figure 2. 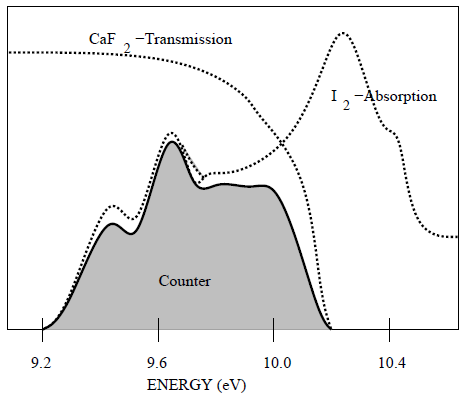 The photon energy is detected by first letting it pass through a CaF2 window into a Iodine gas chamber. The CaF2 window only allows photons with energies up to 10.2eV to pass through. The Iodine absorbs photons with energies above 9.2 eV. The combination of these two filters defines a energy window of 9.2eV to 10.2eV which the photon must of had in order to be detected. This energy resolution of 1eV compares to better than 5meV achievable using electron spectrometers used in PES. by using this kind of detection and scanning the incident electron energies the unoccupied states can be investigated. however due to the poor detector resolution features narrower than 1eV will not be resolved.